It's easy with these tips. Touching up your roots as they grow in is something you can do at home in between salon visits. Even the lovely Duchess of Cambridge, Kate Middleton, has gray roots that need regular touch-ups. In this article, we show you exactly how to cover up new hair growth. We recommend touching up your roots if you have an all-over color that's no more than two shades darker or lighter than your natural hair color. If you try a DIY color that's extreme, you are risking really messing up your hair. We don't recommend DIY touching up of roots on hair that has been highlighted. Watch next time your stylist gives you highlights— thousands of strands get color while thousands do not. Improperly touching up roots would give you an uneven look. Before you get down to the task of camouflaging your new hair growth, you'll need to gather a few items. A box of hair color. You'll want to purchase a color that is as similar as possible to your own processed color. We recommend Clairol Nice 'n Easy Root Touch-Up Kit or L'Oreal's Root Rescue. Latex gloves. Box kits come with cheapie gloves that are ill-fitting. You're best off buying your own if you can. We like these reusable latex hair color gloves but you can buy latex gloves from the drugstore, too. Petroleum jelly to protect your skin from staining. An old button-down shirt to protect your clothes from the dye. A clean toothbrush, a paintbrush, or a mascara wand to replace the crappy nozzle that comes with boxed color. We recommend following the rules on the box because some brands have different guidelines for timing and application. But here are our recommendations (plus a few tips the box won't tell you). Divide hair into four sections, down the middle and from ear to ear. Pin each section up with plastic hair clips. Apply petroleum jelly along your hairline. Mix color as directions suggests on the box (always, always read the directions and follow them, even if you've colored your hair before). Unclip one of the front sections and using the brush, apply color evenly around the perimeter of the section from the roots up to the point where the processed color begins. You will want some overlap. Don't massage into scalp. Use the applicator tip to work in 1-inch panels. Flip hair over and apply color to this new part. Repeat halfway parting until all roots in that section are covered. Re-clip saturated hair, then repeat on remaining three sections. Set the timer for five minutes before the processing time is supposed to end (processing usual takes about 25 minutes). When the timer goes off, comb the color down from roots to ends. This ensures even coverage. Leave on for five minutes. 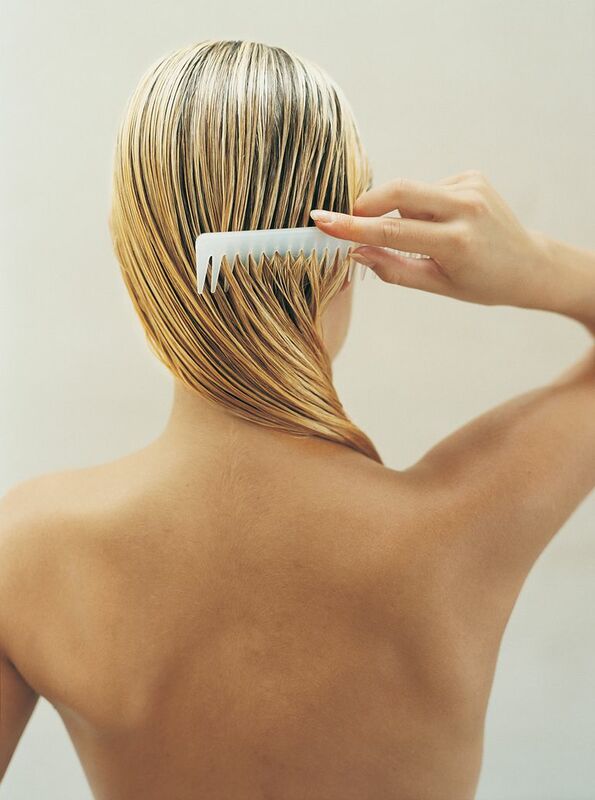 Rinse hair thoroughly in the shower with lukewarm water until the water runs clear. Condition according to package directions (most kits come with conditioner). And that's it! From here, all you have to do is style your hair and show off your gorgeous color. If you don't have time to color your roots, try eyeshadow instead. You'll need to find a shadow that matches your new hair color as closely as possible. Simply spritz your part with hairspray, then pat the shadow onto the roots. Brown will mask gray, while golds work best on blonds. If your color strays onto your skin, apply an astringent like Sea Breeze. The alcohol prevents the dye from staining the skin. And if you are worried about dripping, cover your hair with a shower cap while waiting for your hair to process. This will help keep drips from running.